The 21st Annual Ecumenical Global Holiday Faire is coming and we are very excited about the plans that are underway for First Christian Church's largest Mission Action event of the year! 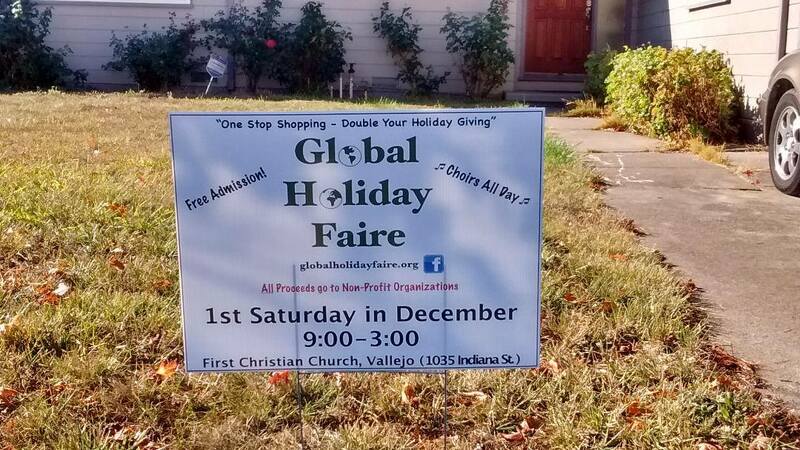 The Faire will be Saturday, December 1, from 9-3 and as always will feature gift items from around the world. This year we will be raising money for 17 different local and global non-profit organizations. We are particularly excited to have Project Have Hope as a new organization this year. They have beautiful hand made jewelry which will be a very welcome addition to our returning gift items. Other popular new organizations from the past few years like Gifts for the Journey (with hand made soaps, lotions and bath products) and the Arkansas Rice Depot will be back too. Plus, there will be new items from long time returning favorites such as SERRV, UPAVIM Crafts and Concern America. This will be the final year that PAL Craftaid will be at the Faire, so this will be your last chance to buy their amazing olive wood carvings from the Holy Land. 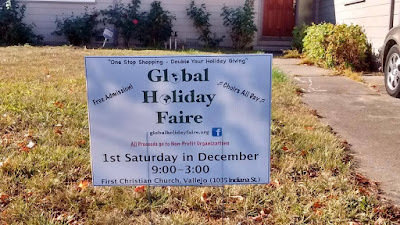 As always there will be "re-gifted" items for sale as well as crafts, gift baskets and baked goods. In addition to great shopping opportunities, homemade lunch will be for sale and choirs and musicians will be performing all day to add to the festive atmosphere. For more information about the Faire, visit globalholidayfaire.org. And remember to 'like' the Faire on Facebook! 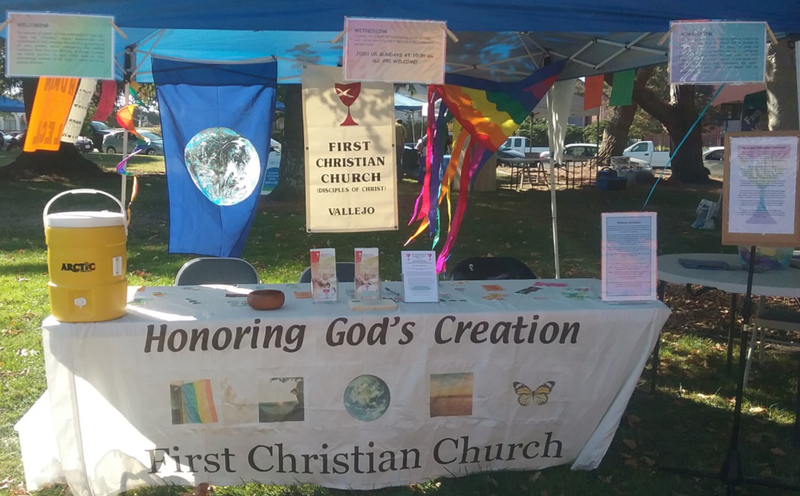 “We wish more churches were doing what you are doing.” This was said by a member of the Vallejo community walking by our booth at Unity Day 2018. He said he was not a believer, but thanked us for being there and gave us a donation. It was a cool moment! -Dear Jesus, thank you for everything you’ve done for me and my family. -Love conquers all. Love kills and cures all at the same time. Love is kind. Love is pure. Love is beautiful. I love you. -Dignity for all families- may they be reunited and have enough to meet their needs. -Strength and growth come through continuous effort and struggle. Never give up. Always keep your head high. -We are all one - only our egos separate us. -Keep thinking positive things. Believe in yourself. Run your own race. These ribbons were hung on the Johnson Garden fence on September 23, as part of our Peace Sunday service. 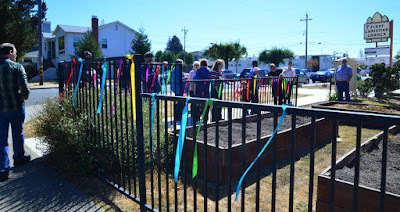 Members of the church who weren't able to make it to Unity Day are still making their own ribbons to add, so the beautiful installation will continue to grow!